After the part-1 this is the contd part of it, now we are going to write the endpoint implementations and mapping these end points to the request from the web. so lets not waste time just jumping into the implementation part here we go. Lets write AbstractPersonEndPoint class which will extend AbstractMarshallingPayloadEndpoint of Spring framework. Here we are going to just create PersonService object and define an abstract method invokeInternal of AbstractMarshallingPayloadEndpoint class. Now its time to create concrete endpoint classes which will have exact business logic implementation and will extend AbstractPersonEndPoint. I will show for one of the service and other implementations are left for you. now lets take a look at the spring-ws-servlet.xml which we already defined in this part-1 section and modify it a little bit as shown below. once this is done just deploy the project and test the request and response from SOAP UI as shown below. a) XML API support: Incoming XML messages can be handled in standard JAXP APIs such as DOM, SAX, and StAX, but also JDOM, dom4j, XOM, or even marshalling technologies. b) Flexible XML Marshalling: The Object/XML Mapping module in the Spring Web Services distribution supports JAXB 1 and 2, Castor, XMLBeans, JiBX, and XStream. And because it is a separate module, you can use it in non-Web services code as well. c) Also, the architecture of Spring-WS resembles that of Spring-MVC. d) Apache license. You can confidently use Spring-WS in your project. 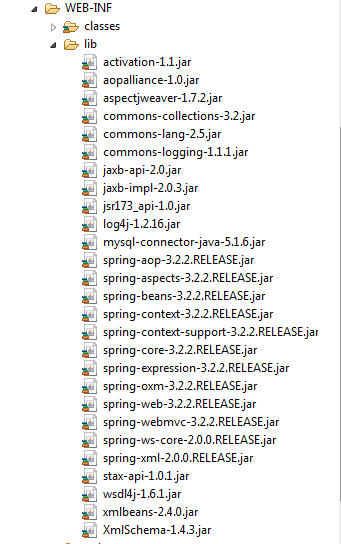 Before moving into the coding part, the essential jars required by the project as as below. Now its time for us to define the service contract. Here’s where we start our contract first approach, the Service contract. 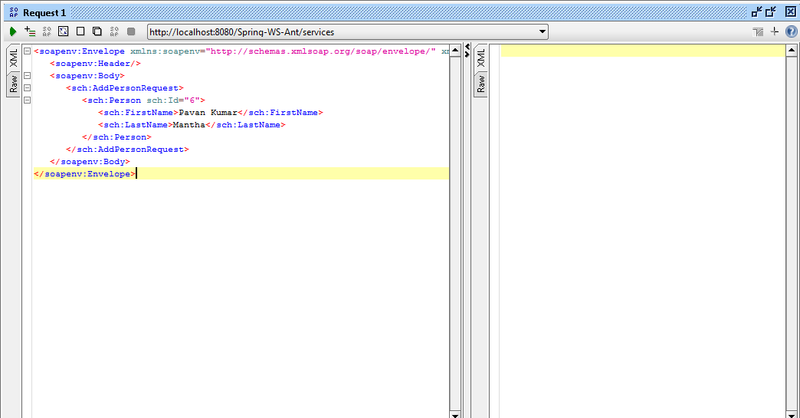 The wsdl contract can be happily generated by Spring’s DefaultWsdl11Definition later. so lets start with simple schema as below. once our schema is ready now lets write simple ant script to generate the jaxb classes and compile them using jaxb’s xjc command using as follows. <project name="Spring-Ws Project With JaxB,XMLBeans and Jibx Capability"
Now lets design our own custom exception class as follows. now lets start with the service class and its implementation class as follows. Now lets write web.xml file as follows. my project structure looks as below. once comleted please deploy the project onto server and run this url we should see the contract wsdl in the browser.